The theme for this month's You Want Pies With That? comes from last month's winner, Erin of Milk and Honey. She went with summer fruits, which are always a favorite of mine. It was also fortuitous timing since I had a flat of raspberries to get through from the Food Preservationists Society. 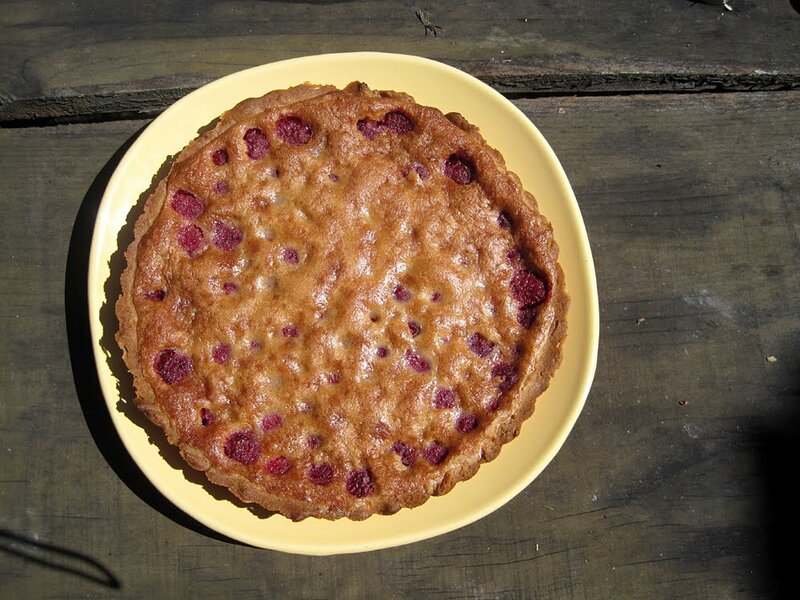 In addition to two kinds of jam, I made this delicious raspberry tart. The crust is a variation on a favorite of mine from Dorie Greenspan - her tender sweet tart crust with added almonds and fresh thyme. This crust is as tasty as shortbread cookies, so it makes the perfect flavorful shell for any filling. The filling in this case is a perfect combination of a nutty brown butter custard and tart berries. The only thing I might change next time is adding just a bit of almond extract to the brown butter custard. This tart is delicious, but also really beautiful, which would make it perfect for entertaining. 1. Put the flour, confectioners' sugar and salt in a food processor and pulse a couple of times. Scatter in the thyme and the pieces of butter and pulse until the butter is coarsely cut in--some pieces the size of oatmeal flakes and some the size of peas. Stir the yolk to break it up, then add it a little at a time, pulsing after each addition. 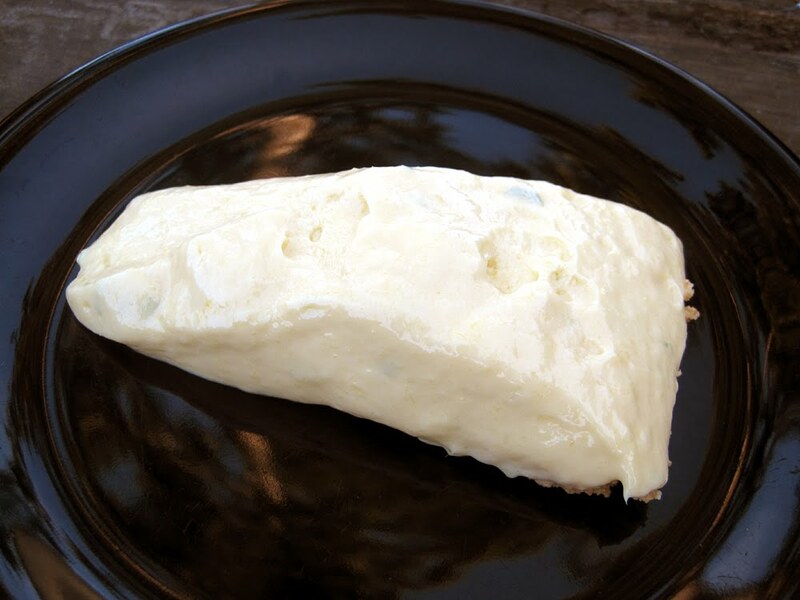 When the egg is in, process in long pulses--about 10 seconds each--until the dough forms clumps and curds. (The sound of the food processor will change just before the dough is ready.) Turn the dough out onto a work surface and press together with your hands lightly, just to incorporate all the dry ingredients. 2. Butter a 9-inch tart pan or pie plate and press the dough evenly over the bottom and sides. Freeze the crust for at least 30 minutes or longer. 3. Preheat the oven to 375 degrees. Cover the crust with a piece of buttered aluminum foil (butter side down) and fit the foil tightly around the crust (note: the foil is not 100% necessary if you are out of it like I was!). Put the tart/pie pan on a baking sheet and bake 25 minutes. Remove the foil and flatten out the crust gently with the back of a spoon. Leave the oven on at 375 degrees and set the crust aside to cool while you make the filling. 1. Whisk sugar, eggs, and salt in medium bowl to blend. Add flour and vanilla; whisk until smooth. 2. Cook butter in heavy small saucepan over medium heat until deep nutty brown (do not burn), stirring often, about 6 minutes. Immediately pour browned butter into glass measuring cup. 3. Gradually whisk browned butter into sugar-egg mixture; whisk until well blended. 4. 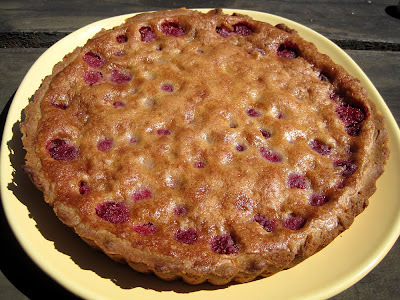 Arrange raspberries in bottom of cooled crust. Carefully pour browned butter mixture evenly over berries. 5. Place tart on rimmed baking sheet. Bake tart until filling is puffed and golden and tester inserted into center comes out clean, about 40 minutes. Cool tart completely in pan on rack. I've been trying to be more responsible about bringing my lunch to campus this summer, because my schedule has just made it far too easy to grab various healthy and less-than-healthy (but almost invariably too expensive) lunches at school. This was one of my first attempts, a cold noodle salad. I wanted to try this recipe for a couple of reasons. First, the sesame noodles at Jamba Juice are one of my go-to lunches when I'm in a hurry, and I thought this might be a somewhat similar recipe, at least in spirit. Second, I was eager to try out fresh udon noodles, which I've never cooked with before. Luckily they were very easy to locate at the grocery store, in the Asian aisle -- of course, your mileage may vary here. I think you could easily substitute other noodles here with good results. And finally, I was determined to use some recipes from a food magazine - I'm so obsessed with these magazines, but it can be hard to remember to use the recipes from them! So, how was the noodle salad? Overall, it was tasty, although this sauce was not my favorite. It was certainly tasty, but I think I would have preferred something a little milder with more of a sesame kick. I would also increase the number of veggies if I did this again - maybe adding some red bell peppers for more color and crunch. 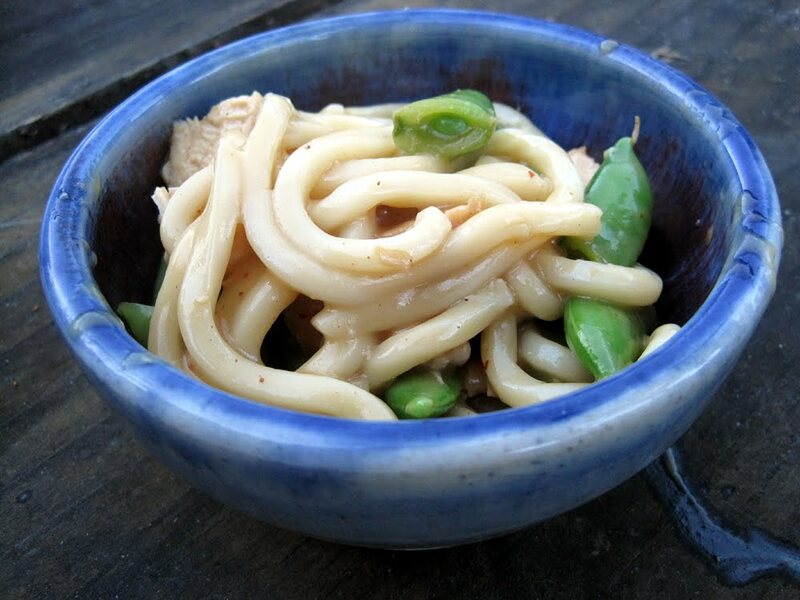 But, it was fantastic to learn about using fresh udon noodles. They were very easy to prepare and came out with the perfect texture, plus the texture held up in the fridge overnight without becoming mushy. Verdict: a good lunch, and I would make this dish again with a different sauce and more veggies. Combine all the ingredients in a blender and blend until smooth. Season to taste with salt and pepper. Bring a pot of water to a boil and salt it. Add the peas and cook for 2 minutes, until crisp-tender. Drain, and run under cold water to stop the cooking. Bring another pot of water to a boil and add the noodles. Cook 3 minutes, drain, and run under cold water. Place in a bowl and toss with sesame oil. Cut the chicken into strips or bite-sized pieces. Toss the peas, noodles, and chicken with the sauce. I have to say, pizza night might be one of my favorite ways to spend time with friends. 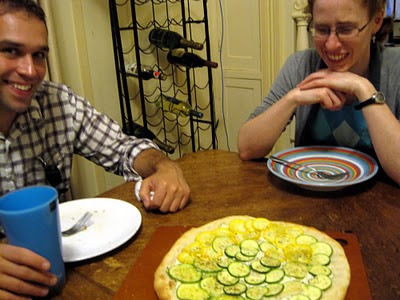 I usually invite a few folks over and make 4-6 pizzas (depending on the crowd), usually with at least a few unusual or exciting toppings thrown in. We have some great pizza pans that I rotate through the oven, and I have everything prepped ahead so I don't have to spend too much time in the kitchen. This pizza is from a pizza night a few weeks ago, and it definitely did not disappoint. 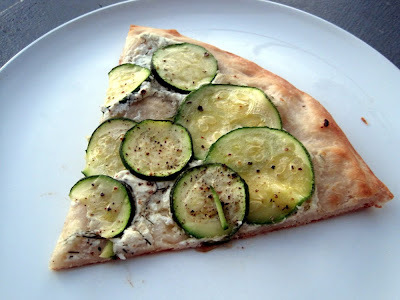 The combination of lemon-y goat cheese and zucchini is really fantastic, with the rich goat cheese and the fresh zucchini making the perfect pairing. Lots of freshly ground black pepper on top rounds everything out with a little spice. 1. Juice and zest the lemon. Add it to the goat cheese along with the basil and mix to combine. Add salt and pepper to taste. 2. Stretch the pizza dough out to cover your pan. Drizzle with olive oil and spread with a pastry brush or fingers until it lightly covers the crust. Add the goat cheese and carefully spread over the pizza. 3. Layer the zucchini over the goat cheese in concentric circles. Top with a generous amount of freshly grated black pepper. 4. Bake in a 500 degree oven until the crust is nicely browned and the zucchini is cooked through. My friends Peter and Nina, about to dig in! Do you have any other suggestions for delicious raspberry recipes you've tried? I'm especially interested in recipes that I could can or freeze to enjoy raspberries throughout the year. This mac-and-cheese recipe is a tad healthier than usual but also extremely yummy. 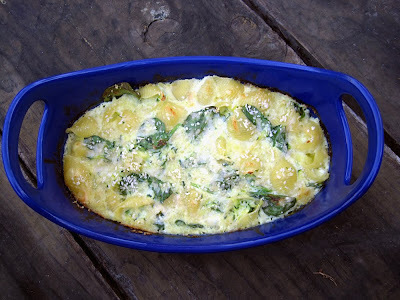 The pasta and cheese are augmented with baby spinach, grated zucchini, and shallots, adding some tasty veggies to the mix. This definitely makes it more of a one-dish meal so you don't have to cook a separate vegtable to make it a complete meal. The cheeses are also different than what I usually use (Gruyere and Parmesan rather than cheddar), which makes everything taste just a little more gourmet. The recipe is definitely a bit more time consuming than my usual recipe for mac and cheese (dump everything in a pot and stir!) but it's well worth the extra effort because this is a very tasty pasta dish. My only complaint was that the sauce broke a bit in the oven and clumped together a little. It was still very tasty (even as lunch a couple of days later!) but not quite as pretty and smooth as it could have been. To fix this next time, I would definitely use the recommended whole milk instead of 2% (which is what I happened to have on hand), and I might include a better melting cheese like Fontina as well to help everything hold together. 1. Grate the zucchini into a colander using the large holes of a box grater. Toss with 1 tsp salt, then place in the sink to drain, about 15 minutes. Squeeze out the excess liquid. 2. Meanwhile, melt 1 tablespoon butter in a large saucepan over medium heat. Add the flour, nutmeg, cayenne, 1/2 tsp salt, and black pepper to taste and mix with a wooden spoon to make a paste. Cook, stirring, until the paste puffs slightly, about 3 minutes. Slowly whisk in the milk, then add the thyme and bay leaf and bring to a boil, stirring. Reduce the heat and simmer until thickened slightly, about 20 minutes. Strain into a bowl; discard the herbs. 3. Meanwhile, position a rack in the upper third of the oven and preheat to 425 degrees F. Bring a large pot of salted water to a boil; add the pasta and cook until al dente, about 8 minutes. Drain and add to the sauce. 4. Melt the remaining 1 T butter in a skillet over medium heat. Add the shallots and cook until translucent, 2 to 3 minutes. Add the zucchini and cook, stirring, until almost tender, about 4 minutes. 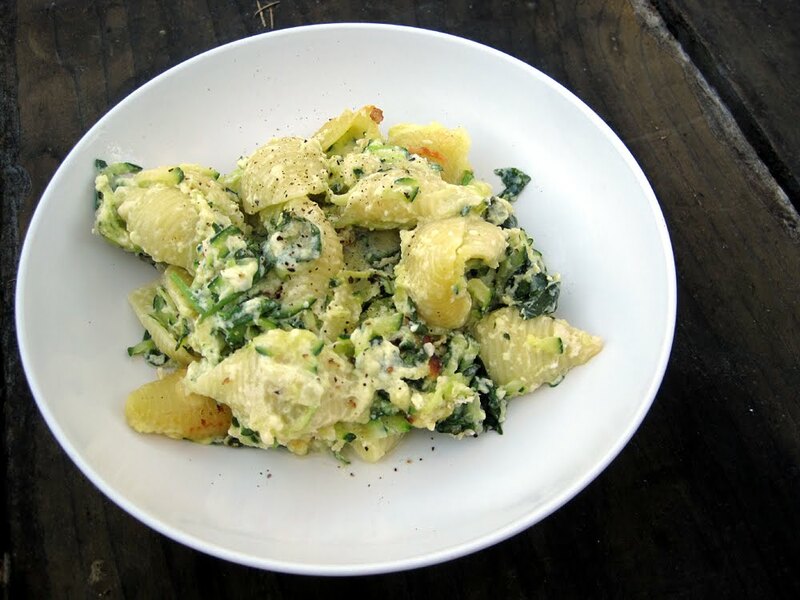 Add the zucchini mixture to the pasta along with the egg yolks and all but a tablespoon or so of the cheese; stir to combine, then add the spinach and stir until slightly wilted. 5. Transfer the mixture to a smallish baking dish and sprinkle with the reserved cheeses and panko. Bake until browned on top and heated through, 20-25 minutes. Let rest 10 minutes before serving. My Pear-Prosciutto-Gruyere pizza from last month tied for the win in last month's You Want Pies With That! Awesomeness! That meant that the other winner - Suz of You Can't Eat What? - and I got to pick the theme for June. We settled on a very summery theme: pies inspired by favorite beach drinks. I decided to go with a mango margarita, which is one of my favorite summer drinks! I can definitely see sipping that on the beach. This pie doesn't require any baking, and it's super easy, especially if you buy a pre-made graham cracker crust. Unfortunately it didn't set very well at all, and ended up being more like mango pudding in a graham cracker crust rather than mango pie! On the bright side, it was very tasty, with lots of fresh mango, lime, and a little tequila. If I made this again, I might put the filling in individual sized graham cracker crusts so it wouldn't matter so much if the filling was soft. Or, I might try adding some unflavored gelatin to help it set up properly. Either way, this pie definitely delivers some great summer flavor and definitely reminded me of mango margaritas! Place the mangoes, cream cheese, sweetened condensed milk, tequila, lime juice, and lime zest in a food processor. Pulse until very smooth. Pour into the crust. Refrigerate until set, at least 2 hours. 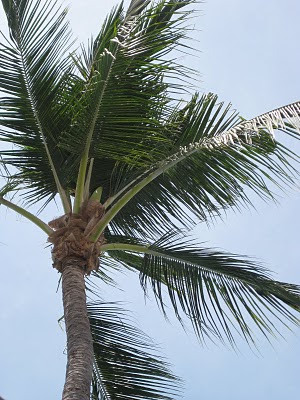 Ah, Mexico. I can hear you calling! 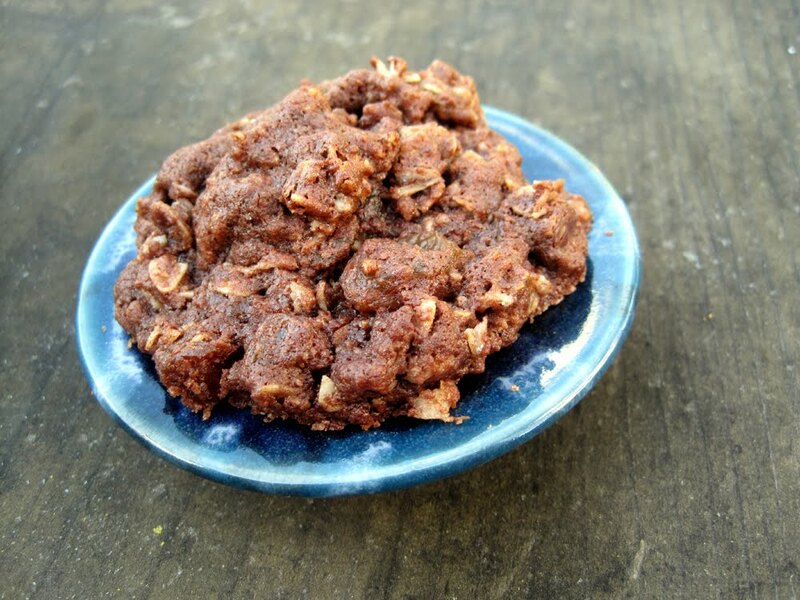 I was in the mood for oatmeal cookies a couple of weeks ago, but chocolate sounded appealing too...luckily I stumbled across this recipe, which gives you the best of both worlds! The cookies have tons of chewy oats, plus chocolate chips and golden raisins for extra yumminess. The chocolate batter is almost gooey when the cookies come out of the oven, and the little bit of Crisco helps the cookies stay soft for a few days. (Of course, feel free to use butter in place of the Crisco if you're not a fan.) Be careful - these are totally addictive! 1. Beat the butter, Crisco, and sugars together until light and fluffy. Add the egg and vanilla and mix to incorporate. 2. Whisk together the cocoa, flour, baking powder, and salt in a small bowl. Add to the butter mixture and mix until incorporated. 3. Mix in the oats, chocolate chips, and raisins. 4. Scoop the cookies onto a foil-lined baking sheet and then bake the cookies in a 350 degree oven for 14-16 minutes. A while back, I won some Bee Raw honey on Blake's Makes. I love winning things. :) And I love honey, so this was a good deal all around. As luck would have it, my housemate bought a big tub of wildflower honey right before my box came, so it took me a while to open up the honey from Bee Raw, but I was definitely glad when I did! It was the wild raspberry variety, and when I first tasted it I thought they'd added actual raspberries to it. Looking at the label, though, I realized it was 100% honey and the flavor came from the flowers the bees were pollinating. So cool! The honey was fantastic on peanut butter and honey sandwiches, as a dip for pretzels, and on top of hot cereal. 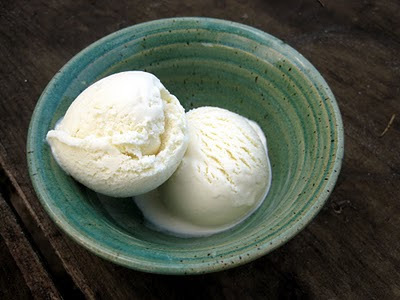 I also made some of it into a batch of honey ice cream, which was entirely delicious! If you have some good honey, I definitely would recommend trying this ice cream. It makes a small batch, just a pint, which in my opinion is the perfect amount since I always love to try new flavors. Plus, it leaves plenty of your honey for other uses. 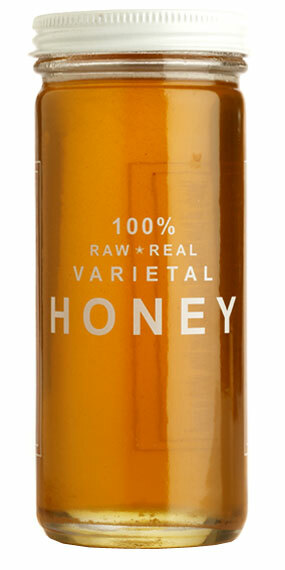 The honey flavor comes through well and is fantastic on its own or with some cookies. In a large bowl, beat the honey and egg yolks until light in color. Heat the milk and cream to a bare boil in a large heavy saucepan. Pour the mixture over the eggs and return the mixture to the saucepan and gently heat (do not boil) until the mixture coats the back of a spoon. Refrigerate for at least 2 hours. Process in your ice cream maker according to the manufacturer's directions.